Overcoming anything is difficult and requires dedication, focus, perseverance and understanding your weak and strong points. Creating the wins before they actually happen, is critical. Our minds and thoughts cultivate our visions, as if harvesting crops. If our focus and efforts lose sight our seeds, will surely not grow, and the cultivating process will never begin. Its been one year and six months, I thought or in some crazy way presumed I had it all figured out. Boy, was I wrong. I’ve learned more about myself, than I’ve learned in fifty years. I’m not advocating or saying to truly understand yourself, you must become ill. What I’m writing about, no matter what the situation is we can overcome anything. I can’t focus on tomorrow, but, I can focus one hundred percent on today. We all have different things and objectives we deal with on a daily basis. Take them and prioritize from the most important to the least, don’t overwhelm ourself. If its only one thing that just fine too. Here’s my opinion, this word multi-task may not work very well with most. You have more time than you think, if your work schedule is eight hours a day, then work those eight hours and not use six of those unproductive. You know exactly what I mean, stop wasting so much of your time doing nothing, and then the last two hours of the day working your tail off. Knowing you’re feeling overwhelmed. Your time matters, and your health matters. Take your breaks and walk-a-round the office, stretch, take your lunch break, but utilize your time effectively and productively. And those two-hour, last-minute rushes, will become productive and useful to you. In order to overcome, one must break the vicious cycles of doing the same thing over again and expecting a different outcome. I call this the crazy-man or women mentality of doing things. We all have our issues, It doesn’t matter what they are, just believing in yourself is the first step. I like to say, don’t cry over spilled milk. It’s done, move on and having a short memory does help a great deal. I call it the five-minute rule, and forget it. Move on to the next project, because you know there are many more important things waiting ahead. Why, is it important to understand our weak points? If every-time you greet a client and the sales goes south, don’t think for a moment that every client that comes in is difficult, try this little exercise, look into a mirror and greet yourself, do you feel warm and fuzzy? You can’t see your expression, but your clients are telling you something. The key here is to understand your weakness and practice a lot. Until your sales start to close, and your efforts are paying off. Sometimes it’s that easy, work on your weak points and roleplaying is another good way to practice your skills. 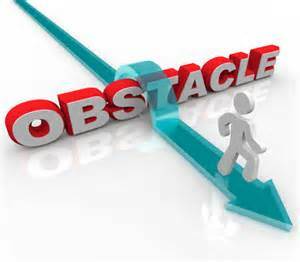 Overcome your obstacles, and become the true professional in your field. Your comments and feed back is much appreciated.